Helen: I remember a Leader in my first meeting talking about losing evenings to cluster feeding/trying to settle your baby. She suggested taking whatever time you do get during the day, as your ‘evening’ without guilt. So if you got a break during the day, say from a good nap, have a snack, watch a film, whatever but take that as your ‘evening’. I thought that was a great idea. Kathryn: I remember my first meeting so clearly. Zack was only 14 weeks and the topic was introducing solid food. It was the first time that I’d heard about baby led weaning. After weaning my older two children using purées, it was a completely new concept to me. My first meeting was also the first time I saw an older baby being breastfed. I remember thinking to myself, that child is wearing shoes and is walking and talking! I’m not sure why the shoes stood out but they did. I remember feeling quite shocked about the information that I heard, but I set out and did my own research on what I’d heard and seen. I’ll remain ever thankful to the mothers and Leaders at my first meeting, who showed me that there are other ways and that natural term feeding is exactly that – natural. Oh, and I’m now the one breastfeeding my older baby – and he wears shoes. 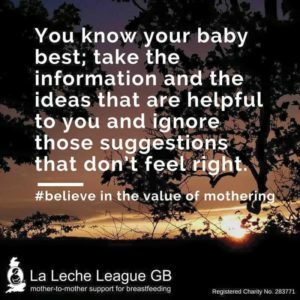 Sue: My first meeting I was cup-feeding expressed milk to my three week old, running out of ideas for how to help my son to feed from me and terrified to go to a breastfeeding group with my milk in bottles. During introductions I cried as I explained our problems. Every face there was welcoming and accepting and supportive and I felt so strongly that they all wanted me to succeed, and believed it was possible. It was the first place I found that belief and trust that we could overcome our challenges. Emma: I found LLL quite by chance when I thought breastfeeding was over before it really had the opportunity to begin. 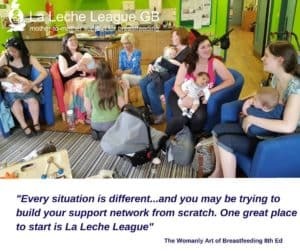 One of the Leaders was the first person to truly listen to me and got me in contact with another Leader who supported me to get breastfeeding back on track. The first meeting I remember was 18 years ago when I was in the host’s kitchen and a toddler wobbled over to his mum who was squatting by the cupboard and he lifted her jumper for some milk. After the struggle I had had to breastfeed my baby, I really wanted this to happen for us too. And I’m so pleased, it did. When I found LLL I discovered the way I wanted to parent my children which made me so happy. I hadn’t known what kind of parent I was going to be and LLL’s philosophy met my needs as well and my children’s. I took all of my babies to LLL meetings and have made some lifelong LLL friends. Rachel: I remember my first meeting very clearly. My baby was nine weeks old and it was the first ‘breastfeeding’ group I had ever been to. My memory is of feeling really out of place, uncomfortable and slightly shocked at seeing walking, talking toddlers breastfeeding, and a mother breastfeeding a baby and a toddler at the same time. I remember thinking that this was a weird hippy group eating weird snacks, unlike any of my other friends. But as I relaxed, I remember hearing the LLL phrase “take what works for you and leave the rest – you know your baby best” and it was the first time, I had felt that I was special as a mother. As I left the meeting, I felt valued, accepted and that ‘they’ celebrated and treasured what it was to be a mother. I kept going back. Eight years on, LLL is still a huge part of my life and I often feel is the only place now where it feels like coming home for my way of mothering. Sarah: I stumbled upon my first LLL meeting via a Facebook invitation to a coffee morning from someone I had met at an NCT event. I went along with my three-week old baby, looking to meet some new friends. I didn’t know that breastfeeding was such an art or such a science. I didn’t know such amazing, gentle, empowering, informative support was available. I didn’t expect a structured group session, ground rules or Leaders! I didn’t know our bodies were capable of tandem feeding (I found out in that meeting, seeing a mother feed her baby and toddler together) and I didn’t know I’d be completely hooked and end up attending for a couple of years. I made such good friends at LLL meetings as the group was a magnet for like-minded women. That first meeting shaped my parenting journey and provided me with somewhere to turn when obstacles appeared in the road ahead. Whether they were due to family attitudes, lack of sleep, returning to work, blocked ducts or biting toddlers! I’m so grateful for the invitation to that first meeting. Rachel: At my first meeting, I found mummies supporting one another, offering helpful ideas, suggestions and tactics. I found reassurance that things were normal and friendly Leaders to listen to my questions. And they always assured me that no question is too silly! Vicky: My first LLL meeting was seven years ago, my baby was four months old and I was still looking to improve things. I had been attending peer support lead groups since the first week, but I still had uncomfortable frequent feeding and no sign of any improvement. I remember a number of women being first timers (the meeting before had been hampered by snow) and sitting in a circle with the Leader and we all had our hands in socks talking about positioning and attachment. I never thought that day would be the start of something very special to me and didn’t dream then that in time I would become a Leader and have a life that was so embroiled in breastfeeding. Barbara: I was invited to my first meeting when I was breastfeeding my nine month old second baby after having nursed the first for three and a half years. I met the Leader who invited me at a mums and toddlers group and it was some time later that she first mentioned LLL. My initial thought when I arrived at the meeting, and found to my surprise that I was not quite as weird as I’d previously assumed myself to be, was, “Why have I never heard of this organisation before?” That feeling was reinforced when I devoured all the literature. Why was this group of women such an underground secret society? My overriding impression then was that this lovely bunch really needed some better publicity. 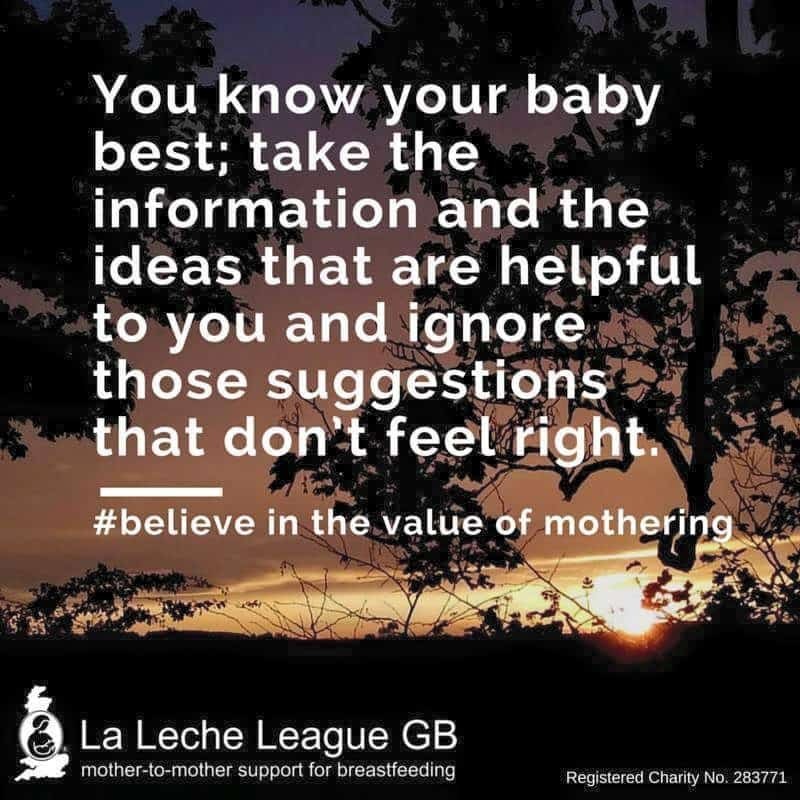 I had gone along thinking I knew everything there was to know about breastfeeding already and over the coming months found that there was a lot more to learn and much more about parenting, support and communication that went far beyond breastfeeding, I’d met the women and ideas that would shape my future and my mothering path. Maria: I remember my first meeting. The lovely local Leader picked me and my baby Sonny up when he was 15 days old. I remember just being in a blur and staring at him for most of the time. I’m so thankful that I went to that first meeting as it reassured me that everything that was happening was NORMAL! The other Leader was so warm and welcoming, I instantly felt safe and comfortable. I got a hot cup of tea! 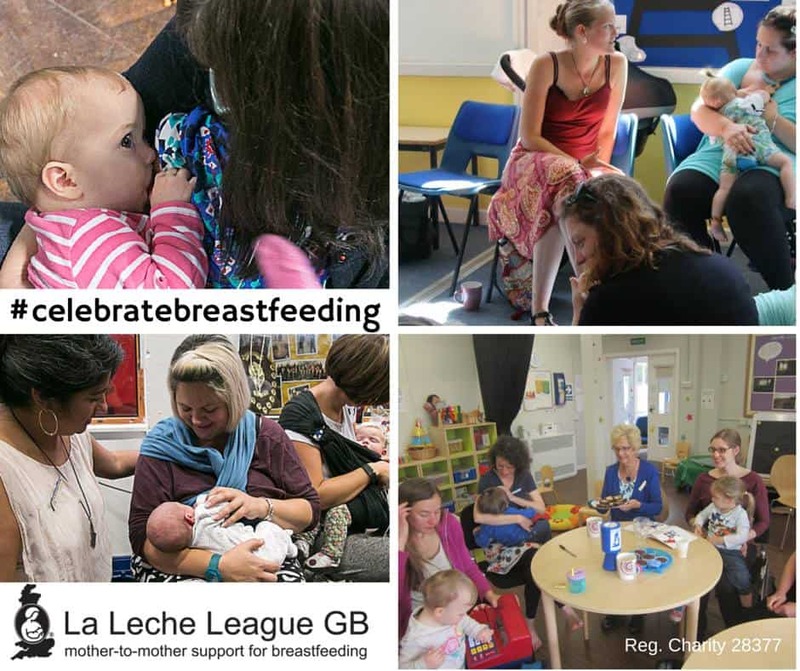 It’s now become a place to go to socialise with like-minded mums and get that ever-needed reassurance when breastfeeding is difficult. Myriam: The first time I managed to get to an LLL meeting was not the first time I had planned to go. It took a few months to get there! I arrived an hour late, with my two and three year olds, in a bit of a state. The friendly, welcoming atmosphere was great and calmed me down. Thank you for this, I still need it regularly!